Cut Glass Search started in 2005. Having dealt in antique glass for over 20 years, it became apparent that there was a demand for good quality cut glass, despite the style setters of the glossy magazines saying otherwise. [Retro is in, and what could be more retro than a sherry schooner? No 1960’s wedding present list would be complete without a china service and glass suite.] 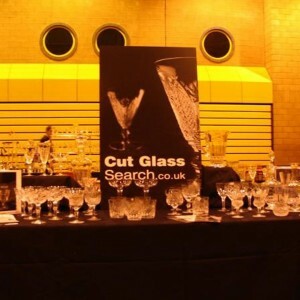 We were regularly asked to match this or find that, so Cut Glass Search was born. We were among the first and the increase in sites dealing in these items suggests an increase in demand. All the well-known factories have closed, though there is still some fine cutting on imported blanks. Occasionally a new glass making business will start up but we are concerned with rescuing the vintage cut glass made by Stuart, Edinburgh, Thomas Webb, Royal Brierley, Webb Corbett, Waterford and Tudor. We travel extensively to source stock, which is bought from auctions, antique outlets and private vendors; otherwise it is an environmentally friendly business, recycling the glass and using mostly second-hand packaging. Living in Shropshire, West Midlands, we have good contacts in the Stourbridge area and are constantly learning more about the glass industry. We endeavour to be knowledgeable and helpful, even if there is no immediate sale. Personal contact is always welcome, but being a small concern we cannot guarantee to answer queries immediately, only as soon as possible.